DPD K9 Dog of the Day :: RickeyStokesNews.com! DPD K9 Unit would like to introduce K9 Bert. 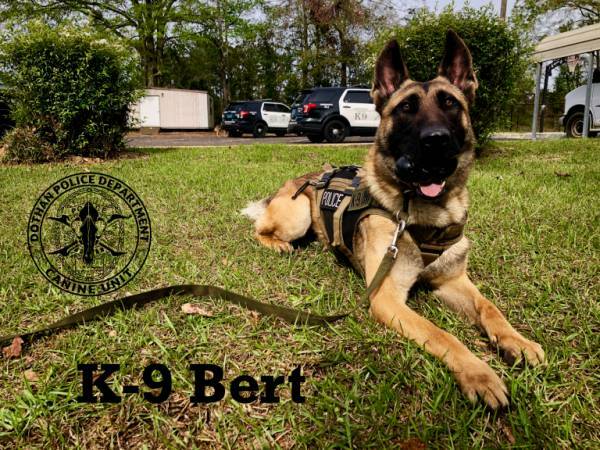 Bert is one of two new partners for the Dothan Police Department and we congratulate him and his Handler on their upcoming graduation from K9 School this week. Bert will celebrate his second birthday in May. He is a Malaherd from Hungary who has only been in the United States for a few months but has adjusted well! His handler says that Bert loves playing with his kong, enjoys coming to work and loves wearing his uniform, a fitted police harness. Welcome Bert.